This weeks Three Clover Thursday Challenge is B+B+B; Brown, Blue and Buttons. My Browns are Chocolate Chip, Close to Cocoa and Creamy Carmel; Buttons - Corduroy; Blue - Pacific Point. The background panel was stamped in Close to Cocoa using the Sanded Background, then I added the Damask in Creamy Carmel and sponge the edges. 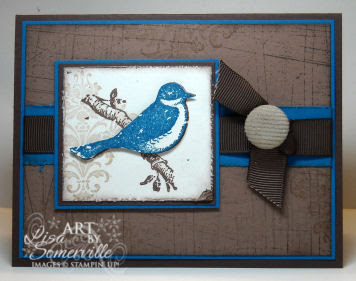 The main image is stamped in Chocolate Chip on Confetti card stock, then I added the Damask in Creamy Carmel. I stamped the bird again in Pacific Point, cut it out and popped it up over the first image. I sponged the edges and used the Cutter Kit for a distressed look. Tied my Chocolate Grosgrain around the Pacific Point strip, then added my Kraft Corduroy Button. Be sure to stop by Kerry's Blog to see what the other Challenge Members created this week to inspire you! Gorgeous! That bird is so lovely. Love the Corduroy button (I need to get some)and the bright color of the Pacific Point blue. Great card. This is fabulous. What a fun challenge too. Very Pretty, Lisa! The Pacific Point really makes it pop! Lisa, this is GORGEOUS! That bird is beautiful and I love that corduroy button!!! LOVE IT!! Very nice. I so love this set and those buttons/brads. Great job on this challenge. You rocked that challenge! I just love that bird - I just love how you colored it.